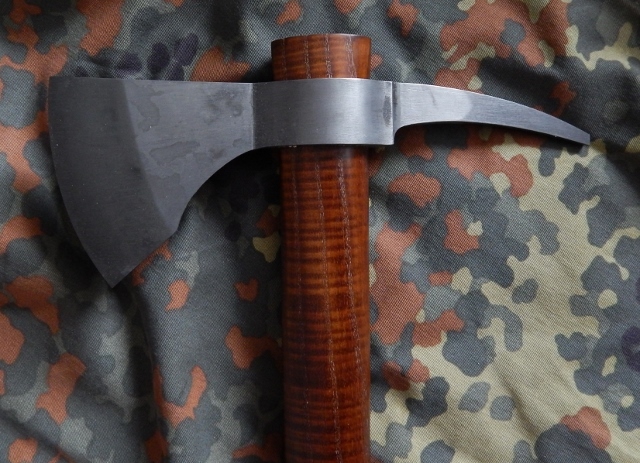 Our TTT (“triple T”) hand-forged tomahawks are created by blacksmith Brian Otto right here in northern Michigan, USA. They each feature a head body composed of 4140 steel bar stock. 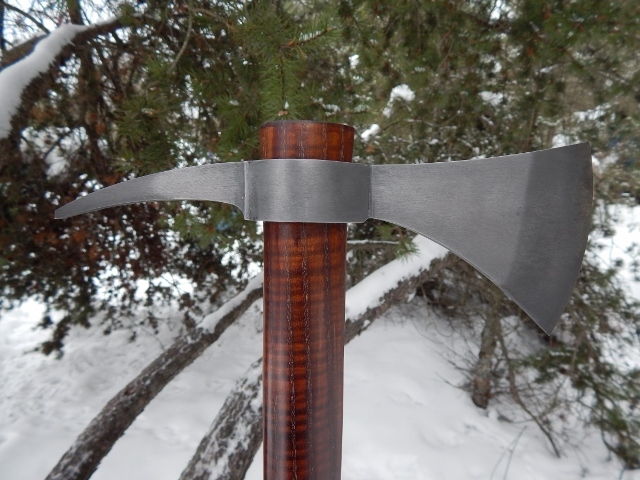 After being hand forged, the tomahawk head is hardened and tempered using a 5 hour process. While time consuming, this process is used because it relieves brittleness and retains more of the hardness than commonly used, faster tempering processes. Using this process produces a blade that holds an edge very well. In other words, these hawks are very sharp! All metal surfaces are draw-filed by hand to give them a more traditional finish versus a belt-sanded finish. The etching (patina) is different shades of gray because the head is differentially heat-treated. 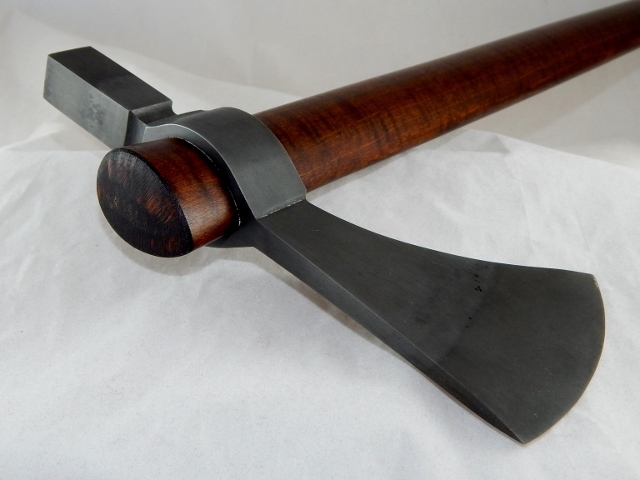 We meticulously fit the handle to the hand-forged tomahawk head to be sure there are no gaps. This helps the head stay firmly in place, usually longer than heads with gaps around the handle. 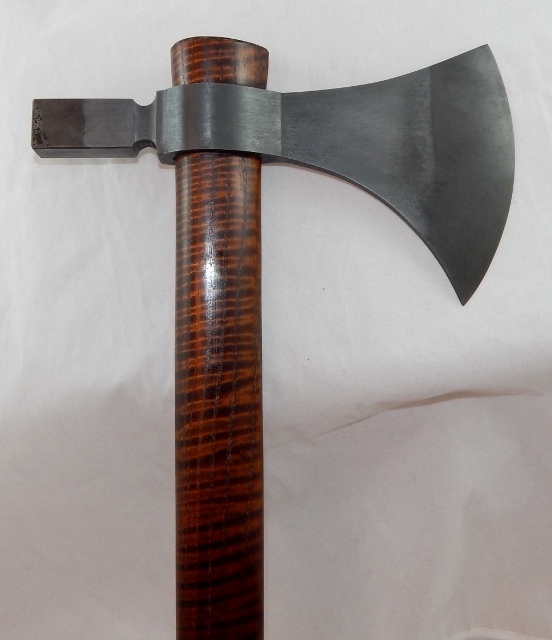 It is important to us to have the wood touch steel around the entire handle opening. Additionally, we dry our handles to a very low moisture content prior to fitting it to the head. This means as normal atmospheric moisture affects the wood over time, the head becomes even more secure. It is less likely to loosen in the winter months when wood naturally dries out and can shrink. Each handle is stained and waxed for appearance and durability. 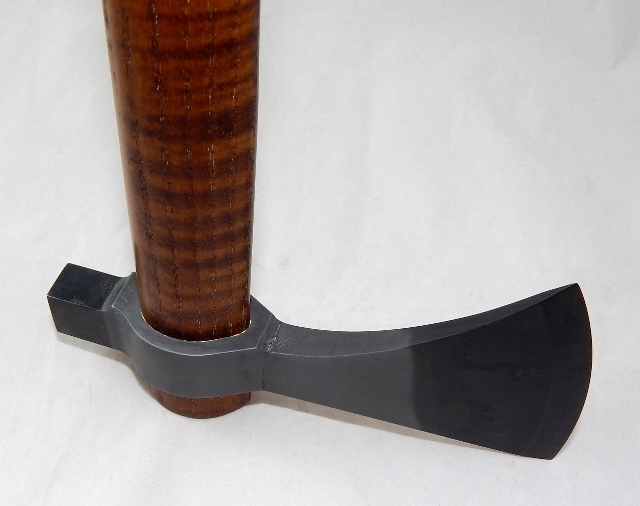 Our hand-forged TTT hawks will accept any standard hawk replacement handle that tapers to 1 1/8"x1 5/8". 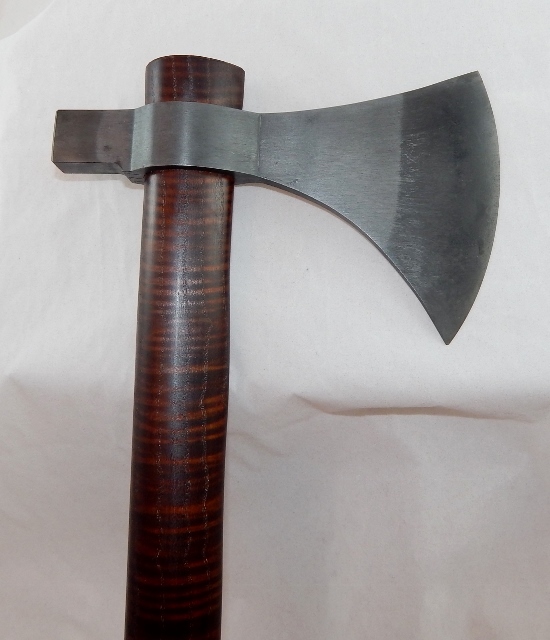 We get all of our Triple T tomahawk handles from Dunlap Woodcrafts. You can purchase replacement handles from us or directly from Dunlap. 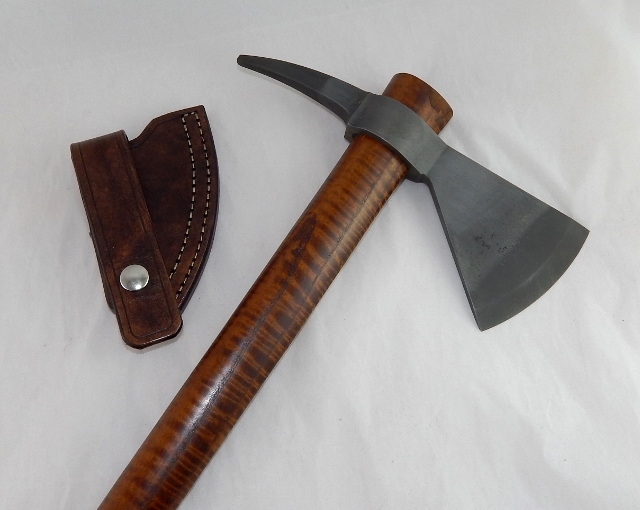 With every hand-forged TTT hawk, we offer a custom-made sheath designed and hand-crafted for the specific tomahawk. Each quality leather sheath has been glued, hand-sewn with abrasion resistant thread, stained and given a protective finish for durability as well as beauty. An extra wide welt is secured with a double row of hand stitching or a single row of stitching combined with copper or brass rivets. A heavy duty line 24 snap is used for closure. The back side of the snap is secured against the welt, not against your blade. This requires more leather, but we feel it is worth it so you don't have to worry about the metal snap back marring your blade finish. 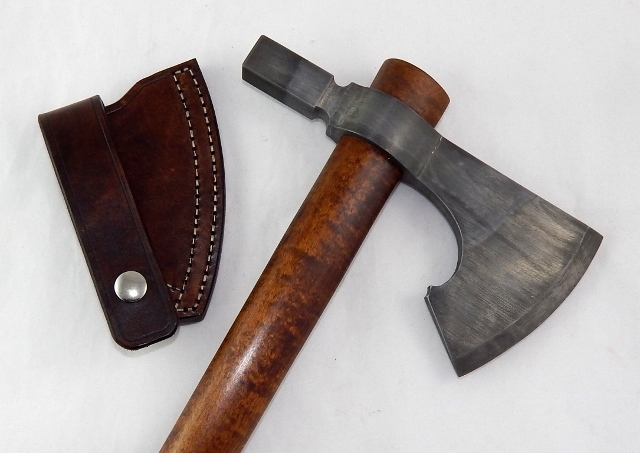 Every sheath is built to last and fits its tomahawk like a glove. Give our hand-forged tomahawks a try. You will NOT be disappointed!! 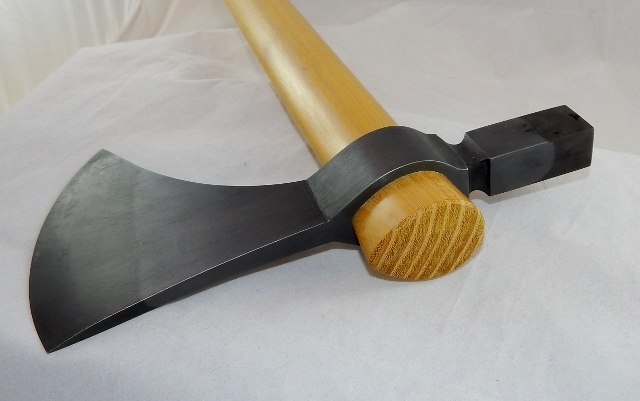 Attention international customers: We can ship tomahawks to some international locations. Contact us to find out if we can ship one to you and to receive a shipping quote.